Little change in birds or weather today, with just 2 chaffinch, 2 grey heron, a thrush flock at the Surgery consisting 35 fieldfare and 4 redwing and 9 snow bunting at Lindswick. The female ring-necked duck is still present on Garso Loch. The wheatear was still by the pier and a robin was at Trebb.2 knot were amongst the golden plover, 14 black-tailed godwit at Bridesness are new, with a merlin and hen harrier also there. noteworthy sighting was of a woodcock at Twingness. The female ring-necked duck is still present on Garso Loch with 6 tufted duck and a minimum of 3 glaucous gulls were seen. The first wheatear was seen by the pier and 2 chaffinch were new in. A Greenland white-fronted and a pink footed goose remained with the greylag flock throughout, with single canada goose and barnacle goose on 7th. 21 long-tailed duck were counted on 5th and up to 3 glaucous gulls were feeding on the dead white-sided dolphin in Nouster Bay. A blue fulmar was occasionally seen along the west side from 15th, a count of 98 fieldfare on 16th and new migrants on 17th included singles of greenfinch, woodpigeon and jackdaw. A goldcrest appeared on 18th and a sand martin on 20th is the earliest ever record. 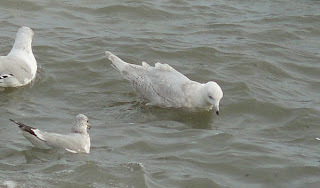 2nd winter kumlien's gull at Bridesness.